A proposal for a new east-west cycleway that would float on the River Thames has been unveiled by a consortium of architects, artists and engineers formed to promote the development of better cycling links in London. 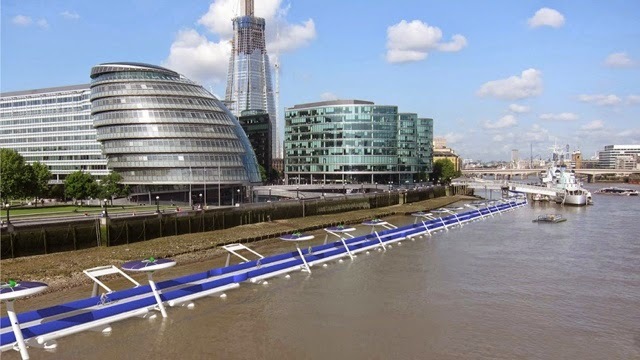 The Thames Deckway aims to provide a solution to the British capital's "deep-seated traffic and pollution problems". Proposed for a 12 kilometre stretch from Battersea in the west to Canary Wharf in the east, the cycleway would run close to the south bank of the river – away from the main water navigation channel. The project by River Cycleway Consortium Ltd would provide a car-free route and potentially slash the journey time from end to end to half an hour by bike. "London needs to think outside the box of conventional solutions to solve its deep-seated traffic and pollution problems," said the company in a statement. "The Thames offers vast, untapped potential to ease and improve London's infrastructure problems. What is needed is imagination to unleash it." The pathway is designed to rise and fall gently with the river's tidal cycle, and to accommodate commuter and leisure cyclists, as well as pedestrians. Embankment ramps would be situated at intervals along the route, along with a series of stopping points and refreshment kiosks. Traffic flow and density, river movement and waves, and any hazardous conditions would be monitored by satellites, weather stations and on-board sensors could relay information directly to the Thames Deckway's users. River Cycleway Consortium Ltd – currently including engineering giant Arup and London-based Hugh Broughton Architects – estimates that construction costs would amount to approximately £600 million, which it would seek from private investment. A flat rate of £1.50 would be charged for single journeys to generate revenue for maintainenance. River Cycleway Consortium Ltd was founded by London artist Anna Hill and architect David Nixon, one of the founding partners of Future Systems. Currently seeking funding for a detailed feasibility study, the company believes that, if successful, the infrastructure could be completed within two years from full go-ahead. Another idea was unveiled back in January. 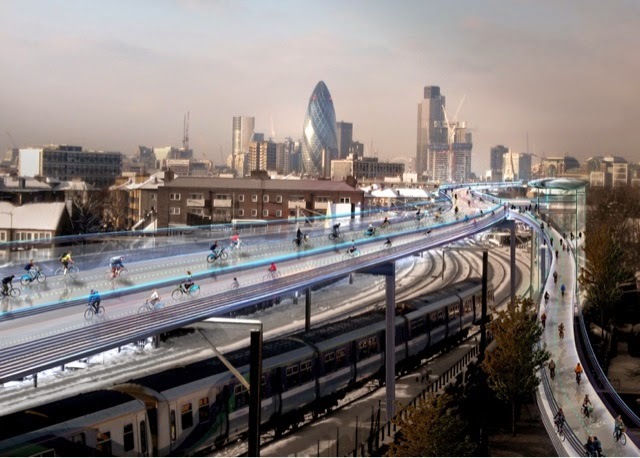 British architect Norman Foster has unveiled a concept to build a network of elevated pathways above London's railways to create safe car-free cycling routes, following 14 cyclist deaths on the city's streets in 2013. Entitled SkyCycle, the proposal by architects Foster + Partners, landscape architects Exterior Architecture and transport consultant Space Syntax is for a "cycling utopia" of approximately 220 kilometres of dedicated cycle lanes, following the routes of existing train lines. Over 200 entrance points would be dotted across the UK capital to provide access to ten different cycle paths. Each route would accommodate up to 12,000 cyclists per hour and could improve journey times across the city by up to half an hour. "SkyCycle is a lateral approach to finding space in a congested city," said Foster, who is both a regular cyclist and the president of Britain's National Byway Trust. "By using the corridors above the suburban railways, we could create a world-class network of safe, car free cycle routes that are ideally located for commuters." If approved, the routes could be in place within 20 years, offering relief to a transport network that is already at capacity and will need to contend with 12 percent population growth over the next decade. "I believe that cities where you can walk or cycle, rather than drive, are more congenial places in which to live," said Foster. "To improve the quality of life for all in London and to encourage a new generation of cyclists, we have to make it safe," he added. "However, the greatest barrier to segregating cars and cyclists is the physical constraint of London's streets, where space is already at a premium." According to the designers, construction of elevated decks would be considerably cheaper than building new roads and tunnels. The routes would offer greater health benefits for London residents and would make more efficient use of space, as more car owners could be encouraged to cycle rather than drive to work. "At crucial points in London's history major infrastructure projects have transformed the fortunes of the capital," said Space Syntax director Anna Rose. "For example, Bazalgette's sewer system helped remove the threat of cholera to keep London at the forefront of the industrial revolution; the Underground strengthened London's core by making long-distance commuting possible." "SkyCycle is conceived in this tradition as a network of strategic connections from the suburban edges to the centre, adding the much needed capacity for hundreds of millions of cycle journeys every year with all the social, economic, environmental and health benefits to London that follow," she added. Cycling safety in London was called into question in November last year when six cyclists died in road accidents in a two-week period, bringing the total for the year up to 14. A poll by BBC News found that one in five cyclists in London stopped cycling to work following the accidents. Boris thinking outside the box,i laugh---cant wait till he's in it,& cyclist's paying 1.50 to use the river system,well that's got to be the first time they've had to pay for anything???? Less daft than the cable car from and to nowhere. Here's an ides, ban PH from within 3 miles of Trafalgar Square, free up a lot of space. Ban Hendy from a 100 miles of London might help too.